7 November 2006: Sweden has a penchant for safety and cleanliness. Swedes invented the Volvo, one of the safest automobiles. Volvos are built to minimize harm to passengers during accidents, and they are built without toxic flame-retardants. Swedes invented the safety- match and dynamite too - much safer than the alternative it replaced, black powder. Recently, Sweden has become known for its innovations in sustainable development - safer development. The Swedish economist and planner Torbjorn Lahti was one of the visionaries in Overtornea - a town of 5,000 that had 25 per cent unemployment and had lost 20 per cent of its population during the previous 20 years. Lahti and his colleagues engaged the community - getting participation from 10 per cent of residents - to create a shared vision of a local economy based on renewable energy, public transportation, organic agriculture, and rural land preservation. 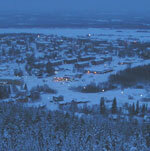 In 2001 the town became 100 per cent free of fossil fuels. Public transportation is free. 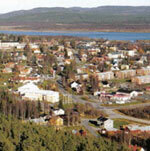 The region is now the largest organic farming area in Sweden and more than 200 new businesses have sprung up. The story of the eco-municipality movement is documented in the new book, The Natural Step for Communities; How Cities and Towns can Change to Sustainable Practices (2004; ISBN 0865714916) written by American planner Sarah James and Torbjorn Lahti. Today there are more than 60 eco-municipalities in Sweden - representing 20 per cent of the population - and this movement for social and ecological sanity has spread throughout Norway, Finland and Denmark as well. In North America, cities like Whistler, British Columbia, Portland, Oregon, and Santa Monica, California are on the bleeding-green edge with city-wide master plans in which sustainability is more than just a buzzword. These cities are making the transition to renewable energy, mass-transit, green building, zero waste and open-space preservation. As a report card on Santa Monica's progress shows, they have a long way to go, especially on the social-justice front, to meet the Brundtland Report definition of sustainability. But they are trending in the right direction. They are trying! Like the Precautionary Principle - which is another lens for sustainability -- the Natural Step (TNS) says that the decision-making process must be inclusive and participatory. TNS recognizes that the communities we live in will be self-sustaining only when resources are justly distributed. You can have the greenest buildings, the cleanest energy in the world, and the best public transportation. But without a just social system, the community will not achieve sustainability. 4. and, in that society human needs are met. In other words, we should minimize harm to the earth and human health; we should use alternatives to fossil fuels, toxic metals, and other persistent toxic substances. We should achieve zero waste (or darn near). And we should protect and restore nature and the ecosystem services it provides. But most importantly, we should meet basic human needs for food, shelter, education and healthcare. I would add that basic human needs include a social environment free of social isolation, bred of racism and classism, an environment that nurtures and respects everyone. The indigenous Sami people -- a trans-arctic people living in Norway, Sweden, Finland and Russia - are struggling to hold on to their traditional reindeer herding culture which is being crowded out by logging, development and environmental degradation. While some groups of Sami - as suggested by TNS for Communities - are transitioning to an economy based on eco-tourism, the growth of that phenomenon isn't necessarily socially, economically and environmentally sustainable. If the traditional Sami culture dies, then this movement has failed. While there are obvious technological fixes to some of our environmental woes - like wind energy and electric vehicles - solving the issues of institutional racism are not specifically addressed by the Natural Step. Still, I believe TNS for Communities does hold several important pearls of wisdom for all cultures. * Begin and guide a planning process with a community-defined vision of a desired future (set goals; involve residents in the process). * Combine vision, planning, and action from the start and throughout the planning process (assess alternatives and choose the best one; pick the low-hanging fruit and dive into real projects that improve lives). * Include the full range of community interests, values, and perspectives in a meaningful way (involve those most affected; use open, democratic decision-making). * Plan in cycles, not just one linear pass (learn from your mistakes and oversights; correct course accordingly). * Focus on finding agreement, not on resolving disagreement (consider the positive). Lead from the side (involve those most affected: let residents be the experts). There is mounting evidence that the Nordic model - including Sweden and Finland - of free education, affordable healthcare, and cradle- to-grave social services combined with high rates of investment in industrial research and development produces a high standard of living and a vibrant economy. The mayor was an early signatory to the Mayors Climate Protection Agreement, endorsed in June 2005 by the US Conference of Mayors, which committed signatories to meet or beat Kyoto Protocol targets in their own communities and to press state and federal governments to act similarly.